Want a case that helps keep your phone safe and clean? Then give the Speck Presidio Pro a try! Speck is a fairly big name in the phone case industry, and I'm a pretty big fan myself. I love the bright and colorful options that they have, the grip that the cases provide, and the protection they offer in the case of accidental drops. One of Speck's newer offerings is the Presidio Pro. The standout feature of this one is the anti-microbial treatment that inhibits the growth of bacteria on the case. Is this one worth getting? Let's dive in. Speck's Presidio Pro is a slim and protective case that adds in an anti-microbial treatment coating so that bacteria doesn't grow on your case, keeping it clean. Many years ago, I remember Speck had a CandyShell Satin, where it was a smooth-touch, matte finish on the back. I had this case for I believe an iPhone 4, and it was one of my favorite cases ever. Unfortunately, Speck never made it again and I was disappointed. The Presidio Pro is the closest that they've come to releasing something similar to that old case. The Presidio Pro is made from tough polycarbonate on the outer shell, and the inside is made with their patented IMPACTIUM lining, which absorbs shock from impact. 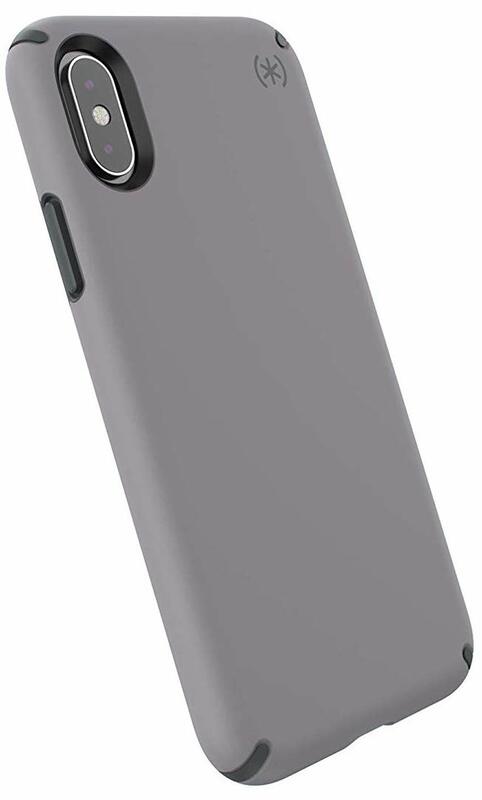 Even though it's a single piece hardshell case, it's still super easy to get your phone in and out: just line it up one side and then push the other side in. To remove, just push it the back while peeling back the top and it'll come right out. The back of the case feels silky smooth to the touch, and I love it since it reminds me of the CandyShell Satin. It's supposedly coated in an anti-microbial treatment that is supposed to inhibit the growth of bacteria on the case (so it's cleaner), but I don't have a microscope to verify that claim. But hey, science, right? With some cases, the buttons end up becoming hard to push, a la Otterbox Symmetry (our review). Fortunately, that isn't the case with the Presidio Pro. The rubber button covers push down easily and the buttons still maintain that clicky feedback, so it's not mushy or impossible to press without strength. The cutouts for the camera and the speakers and microphone are also precise, with the camera having a bit of wiggle room so there's no interference. And like other Speck cases, the front of the Presidio Pro features a raised bezel, so if you place your phone face down on a table, the screen is not touching the surface. It also gives you leeway if you accidentally drop it, as the point of impact will fall on the bezel before the screen (in most cases). Even though I love Speck cases, I've noticed that it doesn't take long for the rubber to wear out, and the Presidio Pro is another one. I've noticed some peeling occurring on the rubber underneath the power button, and some scuffs on the inner bezel. It's minor, but I've only been using the case for about a week or two and it's already happening. Another thing I didn't like about the Presidio Pro is the fact that sometimes it is too smooth and feels almost slippery. I think it's a result of natural oil buildup from your hands, so over time, it loses a little grip and you'll want to wipe it clean. It also tends to get fingerprint smudges easily because of this too. The Speck Presidio Pro is a good option for those who want something that looks slim and classy but still offers great protection from the wear and tear of everyday use. The soft-touch finish feels nice, and perfect for those who prefer matte over glossy. Just be prepared to wipe it down every so often because of smudges.